I live in a world of Goodnight Moon and playdough clumps hidden in the cracks of my dining chairs. Race cars and rocket ships made of used paper towel rolls mingle with my unfolded underwear. I walk the halls with a pedicure, chipped from stumbling over toy trains in the middle of the night. I stroke baby toes, freshly washed, and I think of these things. I think of the piles and the playdough and the never-there feeling of this journey. I remember when I though that Shel would never walk, 12 months, 14 months; all these months were traveling by and he didn’t walk. And suddenly, he did. He walked in October, and he hasn’t looked back. I think about this year. My oldest, almost four and full of Independence, celebrated the 4th of July with red cheeks from running and an aversion to taking pictures. “Mom, I don’t have time for you to take my picture!” he groused, arms folded. I took one anyway, because…because I remember yesterday when he was baby fat and giggles. I stroke his face still in the night, when he sleeps. When my contacts are out, he blurs into a small man, baby features that linger are hidden in the dim light and his mother’s nearsighted-ness. I give him kisses in his sleep. We all watched the fireworks while my baby sleeps. The other baby, the one who is quickly abandoning his baby ways, watched and squealed. It’s a short life. We are all dancing in smoke, in a blur of life that never stops moving. The playdough clumps in the dining chair tell lies, they tell me they will never leave. I get depressed over the state of my laundry pile. I can’t imagine a time where it will divide instead of multiply, but it’s smoke too, and soon it will blow away, boy-man underwear, to college. There will be less laundry soon. So, I’m choosing to be grateful for today, and the mess that comes with it. Seventy-percent of your posts bring a tear to my eye. This one brought a huge lump in my throat. I needed to read it after the three-ring-circus-around-here-called-lunchtime. Choosing to remember this season will be over much too soon. You're so brave and wise. And right. Laundry doesn't matter a lick. I'm here, praying for you. This is beautiful and I loved every word. You know, your right about the playdough clumps in the dining chairs and the laundry. So glad you'll remember the precious moments of your cute kiddos more than you will a spotless house. The cute kiddos are way more fun to remember anyway. this is lovely. so… full, if that makes sense. and i learned this time w/ #4 that having a newborn really makes everyone grow up faster somehow, perhaps b/cs we know how quickly it goes? i remember thinking my oldest would never talk… now i wish he wouldn't sometimes, and if you'd have told me i'd have 4 boys one day, i'd have laughed, and no i do b/cs i do have 4. Daddy, Again….. amen. this is knowing his best is best enough for us. There's something so right about a red-faced boy too busy embracing life to stop and have his picture taken. Something very, very right. Love you. …or maybe it's those spurs that jingle jangle jingle. i grew up hearing a smidgen of this song as part of a medley on my papa's max bygraves tape. and i was singing it as i wrote that blog! Time is flying! I love this post! It focuses on what is important. Good gravy this was absolutely gorgeous. One of my fave posts of yours ever. Now I just want to cry. love this. 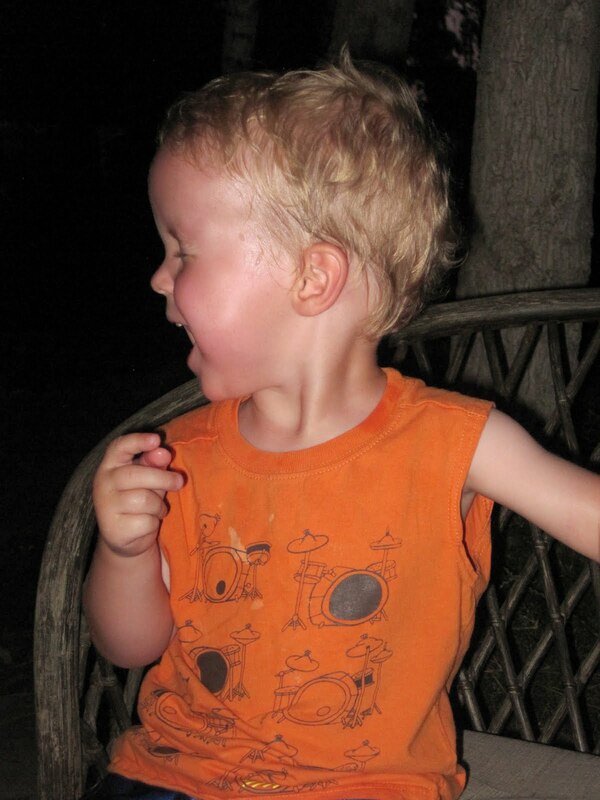 and love your big babies reaction to the fireworks… my big baby (17 mos.) tried to blow them all out. One of the things I miss from when my babies were little was the salty vinegary scent of their sweaty little heads when I kissed them. You are wise to savor every moment. What a perfect way to put it. Really. My sister Nancy tells the story of a day her friend (whose children were a decade older than hers) came to visit. Nancy was packing up to leave for the pediatrician's office for a well-baby check-up. She was overwhelmed by her newborn son and his 19-month-old “big brother”; the weight of it all bore down on her, rendering her teary-eyed. As my sister stuffed wipes and snacks and sippy cups and nursing pads and diapers and sweatshirts andandand into a baby back pack,her friend touched her shoulder. “Your bag will not always be this heavy,” she said. Nancy never forgot those words and their weight, more truthful and dense than any burden. Time with young children is finite and the challenges appear tiny when viewed from a distance, from the future. Nancy's first baby turned 16 yesterday. July 11th. The day of this post. I am so glad you know already about the shifting heaviness of bags. Totally love this one, too (sorry I can't be more creative with my comments this morning…but they are heartfelt, I swear!). joann. we got up early this morning and a few hours later, layed back down for a nap. we got up again, groggy, and as we walked through the living room, my husband snatched up a photo here and there. look at HIM. how did SHE get so big. WE were so young. all i could think was, i would give anything to hold those fat little babies and have them snuggle into me JUST one.more.time. my 16 yo is over 6'; his 15yo bro is gone for the night, and my 5'6″ 12yo daughter is away for 2 wks w family. i can't imagine how we're going to handle their leaving our homes.